I love my Dexters! Anybody who talks to me about them will quickly see that. 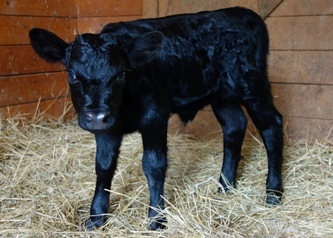 As a hardy heritage breed, they are known for not having much in the way of problems with health, breeding or calving. It’s one of many things that we really love about them. But no breed is 100% free of problems. Sometimes management or diet related issues can cause health problems. And then there are always those individual animals, that for whatever reason have a weakened immune system or some other issue that makes them more prone to problems. And sometimes, crap just happens! Janie’s lovely udder, 2 weeks after calving. Apparently, August was my month for major problems with my Dexters. And on top of the cows, the Anatolian pups have also been experiencing bone-growth related issues common to large breed pups. So I feel a bit like I was in crisis mode the whole month…not fun. Now that I’ve had a chance to catch my breath, here are the two big “Dex-asters” I faced. CPR July Jane was due with her first calf mid-August. Even though Dexters are known for having few calving difficulties, I usually keep a close eye on my girls when they’re getting close to calving, especially my heifers. I put them in the barn overnight so I can check on them easily, and if there IS a problem they’re in a convenient spot. Janie had started bagging up & getting ready early, so was being put to bed in the barn at the beginning of the month already. I put her in on the evening of the 4th just like normal, but didn’t see any significant changes to put me on high-alert…so I didn’t check on her during the night. We got up to a dead calf on the ground the next morning…and will never know what went wrong or why, or if I could have changed the outcome by being there. Janie had been AI’ed to Belle Fourche Clay, and the calf was a red heifer, so I was extremely disappointed. Janie is turning into a fine, young cow. But now I was faced with a dilemma. I had already decided quite some time ago that I would NOT try to train Janie to milk, even though she has excellent milk production bloodlines behind her. She has remained rather shy & skittish about being handled. And she has always been quite the kicker…the only one to ever kick me over having tail hairs pulled for DNA testing! She also was still very uncomfortable coming into the milking parlor, even though she had been getting treats in there for quite some time. But now, here she was with a full udder & no calf to nurse. So do I, or don’t I? I decided to give it a try. The first few days of milking looked hopeful, as she did much better than I expected. But then, instead of calming down & getting better, her behavior just got worse. Milking an unwilling, kicky cow twice a day just really is not my idea of a good time. But, oh my goodness, her milk was fabulous! About a week in, I decided to pull her back to once a day milking to try to drop her production back a bit, which it did. Then, after two weeks of practically dragging her into the parlor every day, getting kicked & bruised, I stopped milking on the 18th & dried her off. Janie had a chance at being a milk cow, but it just wasn’t going to work. I wasn’t really surprised. 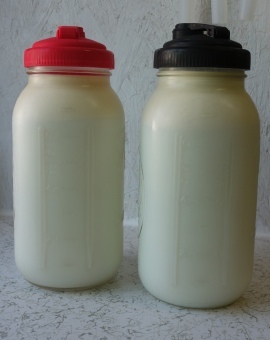 Check out that cream line on Janie’s milk! So yummy! 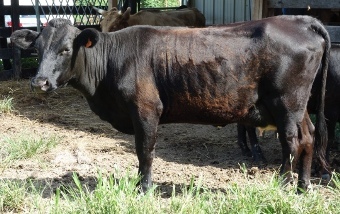 ZH Taco’s Tundra was due with her second calf the end of August, and was also looking ready earlier than expected. I was looking forward to training her to milk this time around, being anxious to see how much improvement Taco made over Sara in the milk department. When I tucked her in the barn the evening of the 23rd, I was pretty sure she was in early labor, and a check later on before my bedtime confirmed it. She calved at 12:30 am, and gave me a gorgeous black heifer, the result of an AI breeding to RdoubleD Rambling Bob. Hooray! Unfortunately when I commenced with milking training in the morning, the nastiness I found in the milker made my heart drop to the pit of my stomach. MASTITIS! It was all cheese-y chunks & watery fluid. Mastitis is something I’ve not had to deal with in my 9 1/2 years of cow ownership, even with BoPeep who is a Jersey cross, and it’s something I was hoping to be able to dodge. It’s another of those things that Dexters don’t normally have problems with. So much for that! Now I was getting a crash course in how to treat mastitis. Tundra’s heifer, Brannagh, the day after she was born. What a nice, thick girl! I knew enough to know that I needed her calf to be nursing frequently and to keep hand-stripping out as much as I could. I also got sterile samples from each quarter for the vet to send to the lab for a culture, and also a sensitivity test, so we would know what organisms we were dealing with & what to treat it with. I learned how to do teat infusions, and we also treated with systemic antibiotics, as well as anti-inflammatories to help keep Tundra’s fever down. Thankfully, it wasn’t a terribly nasty bug and she recovered just fine. But it certainly wasn’t fun! So, needless to say, with back-to-back problems, August was a stressful month for me. But, we got through it & life goes on, and I’ve learned to not take trouble-free for granted! How are the pups doing? Do they have pano? I am not anti vx, but in large breeds we do see it after combo vaccines and I personally delay the vx a bit in hopes of reducing issues. And raw diet with no grain and lots of fat and moderate protein with vitamin c and other supplements :). Seriously, I can’t believe the auto correct!!! That should read vx not BC and combo vaccines:). The all in one vx with unnecessary extras are hard on them. Hi Heather. Yes, Demir had pano, first in the one front leg, and now in the other. But poor Batu had what seemed more like HOD in both front metatarsal joints at the same time.